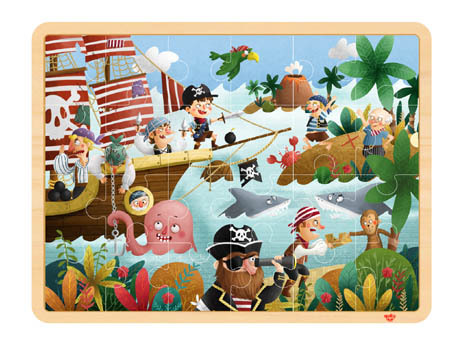 Wooden Pirate Puzzle 24 Pieces is a riot of colour and action and a great challenge for your own little pirate. This puzzle is 40cm x 30cm and comes in a solid wooden frame to hold it all in place. We like this because: "An exciting engaging image and a great size. " I adore your site.Your products are gorgeous, hard-wearing (essential when buying for kids!) and well-priced. Your service is amazing and always helpful. Shopping online would be paradise if every online shop had the same level of service and product that you do! Keep up the brilliant work.